Humoral immunity refers to mechanisms of the adaptive immune defenses that are mediated by antibodies secreted by B lymphocytes, or B cells. This section will focus on B cells and discuss their production and maturation, receptors, and mechanisms of activation. Like T cells, B cells are formed from multipotent hematopoietic stem cells (HSCs) in the bone marrow and follow a pathway through lymphoid stem cell and lymphoblast (see Figure 1 in Cellular Defenses). Unlike T cells, however, lymphoblasts destined to become B cells do not leave the bone marrow and travel to the thymus for maturation. Rather, eventual B cells continue to mature in the bone marrow. The first step of B cell maturation is an assessment of the functionality of their antigen-binding receptors. This occurs through positive selection for B cells with normal functional receptors. A mechanism of negative selection is then used to eliminate self-reacting B cells and minimize the risk of autoimmunity. Negative selection of self-reacting B cells can involve elimination by apoptosis, editing or modification of the receptors so they are no longer self-reactive, or induction of anergy in the B cell. Immature B cells that pass the selection in the bone marrow then travel to the spleen for their final stages of maturation. There they become naïve mature B cells, i.e., mature B cells that have not yet been activated. Compare the maturation of B cells with the maturation of T cells. Figure 1. B-cell receptors are embedded in the membranes of B cells. The variable regions of all of the receptors on a single cell bind the same specific antigen. Like T cells, B cells possess antigen-specific receptors with diverse specificities. Although they rely on T cells for optimum function, B cells can be activated without help from T cells. B-cell receptors (BCRs) for naïve mature B cells are membrane-bound monomeric forms of IgD and IgM. They have two identical heavy chains and two identical light chains connected by disulfide bonds into a basic “Y” shape (Figure 1). The trunk of the Y-shaped molecule, the constant region of the two heavy chains, spans the B cell membrane. The two antigen-binding sites exposed to the exterior of the B cell are involved in the binding of specific pathogen epitopes to initiate the activation process. It is estimated that each naïve mature B cell has upwards of 100,000 BCRs on its membrane, and each of these BCRs has an identical epitope-binding specificity. In order to be prepared to react to a wide range of microbial epitopes, B cells, like T cells, use genetic rearrangement of hundreds of gene segments to provide the necessary diversity of receptor specificities. The variable region of the BCR heavy chain is made up of V, D, and J segments, similar to the β chain of the TCR. The variable region of the BCR light chain is made up of V and J segments, similar to the α chain of the TCR. Genetic rearrangement of all possible combinations of V-J-D (heavy chain) and V-J (light chain) provides for millions of unique antigen-binding sites for the BCR and for the antibodies secreted after activation. One important difference between BCRs and TCRs is the way they can interact with antigenic epitopes. Whereas TCRs can only interact with antigenic epitopes that are presented within the antigen-binding cleft of MHC I or MHC II, BCRs do not require antigen presentation with MHC; they can interact with epitopes on free antigens or with epitopes displayed on the surface of intact pathogens. Another important difference is that TCRs only recognize protein epitopes, whereas BCRs can recognize epitopes associated with different molecular classes (e.g., proteins, polysaccharides, lipopolysaccharides). Activation of B cells occurs through different mechanisms depending on the molecular class of the antigen. Activation of a B cell by a protein antigen requires the B cell to function as an APC, presenting the protein epitopes with MHC II to helper T cells. Because of their dependence on T cells for activation of B cells, protein antigens are classified as T-dependent antigens. In contrast, polysaccharides, lipopolysaccharides, and other nonprotein antigens are considered T-independent antigens because they can activate B cells without antigen processing and presentation to T cells. What types of molecules serve as the BCR? What are the differences between TCRs and BCRs with respect to antigen recognition? Which molecule classes are T-dependent antigens and which are T-independent antigens? 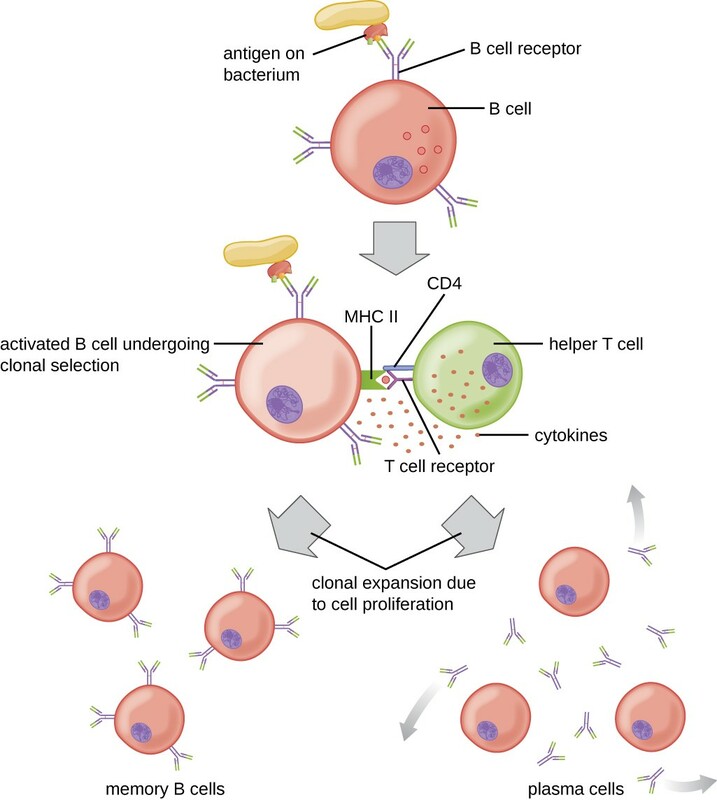 Activation of B cells without the cooperation of helper T cells is referred to as T cell-independent activation and occurs when BCRs interact with T-independent antigens. T-independent antigens (e.g., polysaccharide capsules, lipopolysaccharide) have repetitive epitope units within their structure, and this repetition allows for the cross-linkage of multiple BCRs, providing the first signal for activation (Figure 2). Because T cells are not involved, the second signal has to come from other sources, such as interactions of toll-like receptors with PAMPs or interactions with factors from the complement system. Once a B cell is activated, it undergoes clonal proliferation and daughter cells differentiate into plasma cells. Plasma cells are antibody factories that secrete large quantities of antibodies. After differentiation, the surface BCRs disappear and the plasma cell secretes pentameric IgM molecules that have the same antigen specificity as the BCRs (Figure 2). The T cell-independent response is short-lived and does not result in the production of memory B cells. Thus it will not result in a secondary response to subsequent exposures to T-independent antigens. Figure 2. T-independent antigens have repeating epitopes that can induce B cell recognition and activation without involvement from T cells. A second signal, such as interaction of TLRs with PAMPs (not shown), is also required for activation of the B cell. Once activated, the B cell proliferates and differentiates into antibody-secreting plasma cells. What are the two signals required for T cell-independent activation of B cells? Figure 3. Click for a larger image. In T cell-dependent activation of B cells, the B cell recognizes and internalizes an antigen and presents it to a helper T cell that is specific to the same antigen. The helper T cell interacts with the antigen presented by the B cell, which activates the T cell and stimulates the release of cytokines that then activate the B cell. Activation of the B cell triggers proliferation and differentiation into B cells and plasma cells. T cell-dependent activation of B cells is more complex than T cell-independent activation, but the resulting immune response is stronger and develops memory. T cell-dependent activation can occur either in response to free protein antigens or to protein antigens associated with an intact pathogen. Interaction between the BCRs on a naïve mature B cell and a free protein antigen stimulate internalization of the antigen, whereas interaction with antigens associated with an intact pathogen initiates the extraction of the antigen from the pathogen before internalization. Once internalized inside the B cell, the protein antigen is processed and presented with MHC II. The presented antigen is then recognized by helper T cells specific to the same antigen. The TCR of the helper T cell recognizes the foreign antigen, and the T cell’s CD4 molecule interacts with MHC II on the B cell. The coordination between B cells and helper T cells that are specific to the same antigen is referred to as linked recognition. Once activated by linked recognition, TH2 cells produce and secrete cytokines that activate the B cell and cause proliferation into clonal daughter cells. After several rounds of proliferation, additional cytokines provided by the TH2 cells stimulate the differentiation of activated B cell clones into memory B cells, which will quickly respond to subsequent exposures to the same protein epitope, and plasma cells that lose their membrane BCRs and initially secrete pentameric IgM (Figure 3). After initial secretion of IgM, cytokines secreted by TH2 cells stimulate the plasma cells to switch from IgM production to production of IgG, IgA, or IgE. This process, called class switching or isotype switching, allows plasma cells cloned from the same activated B cell to produce a variety of antibody classes with the same epitope specificity. Class switching is accomplished by genetic rearrangement of gene segments encoding the constant region, which determines an antibody’s class. The variable region is not changed, so the new class of antibody retains the original epitope specificity. What steps are required for T cell-dependent activation of B cells? 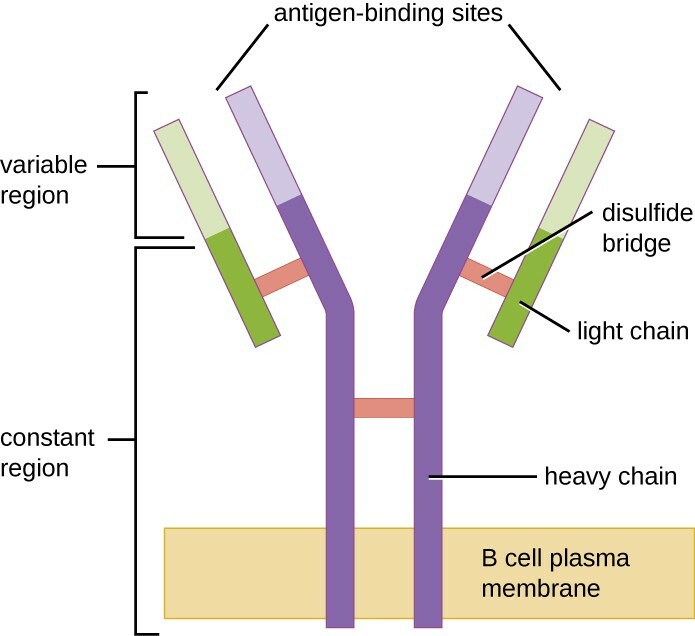 What is antibody class switching and why is it important? T cell-dependent activation of B cells plays an important role in both the primary and secondary responses associated with adaptive immunity. With the first exposure to a protein antigen, a T cell-dependent primary antibody response occurs. The initial stage of the primary response is a lag period, or latent period, of approximately 10 days, during which no antibody can be detected in serum. This lag period is the time required for all of the steps of the primary response, including naïve mature B cell binding of antigen with BCRs, antigen processing and presentation, helper T cell activation, B cell activation, and clonal proliferation. The end of the lag period is characterized by a rise in IgM levels in the serum, as TH2 cells stimulate B cell differentiation into plasma cells. IgM levels reach their peak around 14 days after primary antigen exposure; at about this same time, TH2 stimulates antibody class switching, and IgM levels in serum begin to decline. Meanwhile, levels of IgG increase until they reach a peak about three weeks into the primary response (Figure 4). During the primary response, some of the cloned B cells are differentiated into memory B cells programmed to respond to subsequent exposures. This secondary response occurs more quickly and forcefully than the primary response. The lag period is decreased to only a few days and the production of IgG is significantly higher than observed for the primary response (Figure 4). In addition, the antibodies produced during the secondary response are more effective and bind with higher affinity to the targeted epitopes. Plasma cells produced during secondary responses live longer than those produced during the primary response, so levels of specific antibody remain elevated for a longer period of time. Figure 4. Compared to the primary response, the secondary antibody response occurs more quickly and produces antibody levels that are higher and more sustained. The secondary response mostly involves IgG. What events occur during the lag period of the primary antibody response? Why do antibody levels remain elevated longer during the secondary antibody response? B lymphocytes or B cells produce antibodies involved in humoral immunity. B cells are produced in the bone marrow, where the initial stages of maturation occur, and travel to the spleen for final steps of maturation into naïve mature B cells. B-cell receptors (BCRs) are membrane-bound monomeric forms of IgD and IgM that bind specific antigen epitopes with their Fab antigen-binding regions. Diversity of antigen binding specificity is created by genetic rearrangement of V, D, and J segments similar to the mechanism used for TCR diversity. Protein antigens are called T-dependent antigens because they can only activate B cells with the cooperation of helper T cells. Other molecule classes do not require T cell cooperation and are called T-independent antigens. T cell-independent activation of B cells involves cross-linkage of BCRs by repetitive nonprotein antigen epitopes. It is characterized by the production of IgM by plasma cells and does not produce memory B cells. T cell-dependent activation of B cells involves processing and presentation of protein antigens to helper T cells, activation of the B cells by cytokines secreted from activated TH2 cells, and plasma cells that produce different classes of antibodies as a result of class switching. Memory B cells are also produced. Secondary exposures to T-dependent antigens result in a secondary antibody response initiated by memory B cells. The secondary response develops more quickly and produces higher and more sustained levels of antibody with higher affinity for the specific antigen. Which of the following would be a T-dependent antigen? Answer c. Protein is a T-dependent antigen. Which of the following would be a BCR? Answer d. IgD is a BCR. Which of the following does not occur during the lag period of the primary antibody response? Answer b. Class switching to IgG does not occur during the lag period of the primary antibody response. ________ antigens can stimulate B cells to become activated but require cytokine assistance delivered by helper T cells. T-dependent antigens can stimulate B cells to become activated but require cytokine assistance delivered by helper T cells. T-independent antigens can stimulate B cells to become activated and secrete antibodies without assistance from helper T cells. These antigens possess ________ antigenic epitopes that cross-link BCRs. T-independent antigens can stimulate B cells to become activated and secrete antibodies without assistance from helper T cells. These antigens possess repetitive antigenic epitopes that cross-link BCRs. A patient lacks the ability to make functioning T cells because of a genetic disorder. Would this patient’s B cells be able to produce antibodies in response to an infection? Explain your answer.